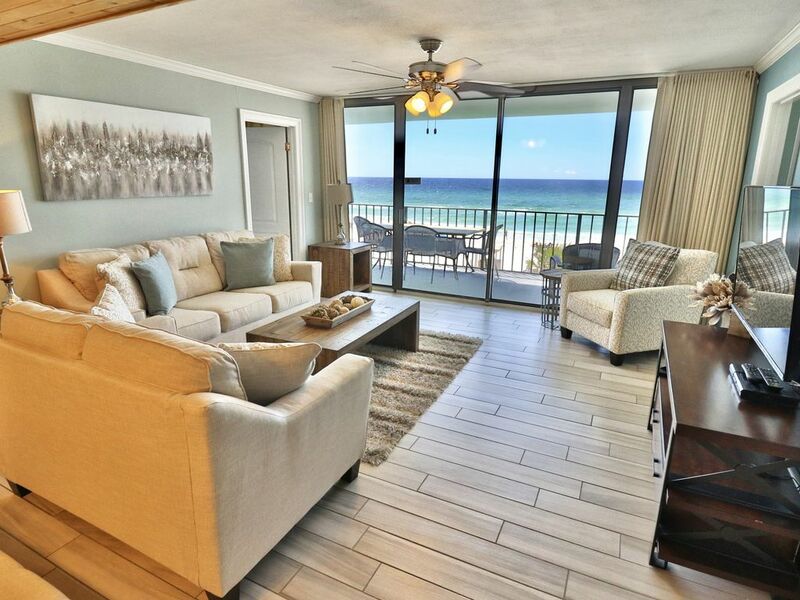 This layout is one of the only 3 bedrooms in all of Panama City Beach with 2 of the bedrooms on the ocean. The living room and all bedrooms have flat screen tvs with cable tv. The 3rd bedroom has 2 queen size beds and a flat screen tv. The living room has a queen size pull out couch. Breathtaking third floor view! Not too high, not too low. Use the elevator if you like, or walk the stairs. Cannot beat the 2 master bedrooms with balcony access. We manage and rent out many condos in Panama City Beach and this 3 bedroom 3 bath is one of the only one I have ever seen with 2 master bedrooms overlooking the Gulf. Most other 3 bedrooms have only 2 bathrooms but this one has 3 full bathrooms.